Christian Economics: Cause of the Recession? 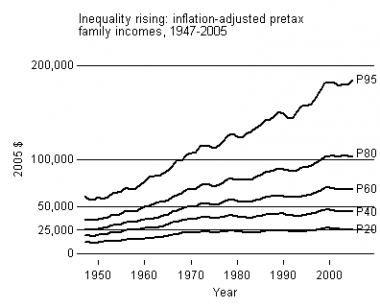 Income inequality growth is a controversial economic indicator and one that I think is overlooked too frequently. The gini coefficient which measures income inequality has reached its highest point since the measurement began in 1967. 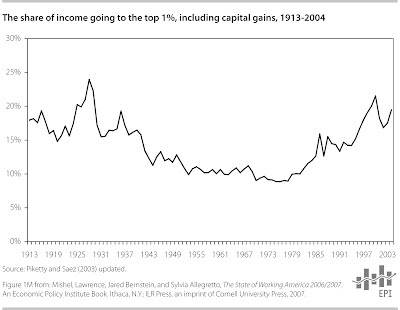 The following graph shows how incomes in the bottom percentiles have stagnated, while the incomes at the top continue to grow. GDP growth without income growth in the bottom precentiles means that the top are getting all the gains and the bottom are getting none. The bottom percentiles make up the majority of consumer spending which is the largest component of GDP. Consumers shouldn't continue their spending increases by decreasing their savings and increasing their debt when their incomes don't increase. These practices help cause bubbles because the increases aren't based on real income growth, but on temporary movements of portfolios. Consumers did this banking on income growth that never came and the bubble popped causing our current recession. People with lower incomes have a higher marginal propensity to consume, that is, with every dollar they earn, they are more likely to spend a higher portion of it (as you can see by the savings rate, generally over 90 cents on the dollar). Wealthier people, on the other hand, usually save more of it in a form that earns interest. They also invest a large portion of their money to make more money, but investment responds to consumer spending, which can't increase if the top has all the income growth and a large share of the total income. So wealthier people stop investing their money when spending stops. Consumers can't spend without the income, and businesses, owned by the top quintile who have the money, won't spend. Businesses are currently having no trouble obtaining really cheap loans to invest, they are simply choosing not to because they are waiting for consumers to start spending again. This is also why I think tax breaks to small business owners won't jumpstart the economy. They won't hire and invest without assurance that consumers will increase spending again. 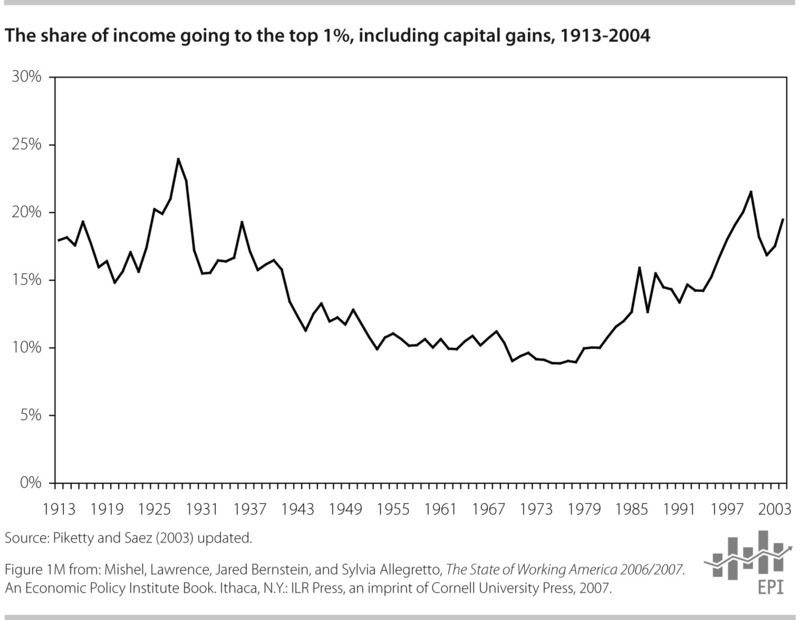 Increasing incomes of the bottom percentiles must occur if we want spending to increase. Higher marginal tax rates would redistribute the income, and this is the current debate between Democrats and Republicans that has been postponed due to the November elections. It would be better if the government didn't have to intervene, but if the market fails and inequality continues to grow then there will be greater problems than simple income inequality. 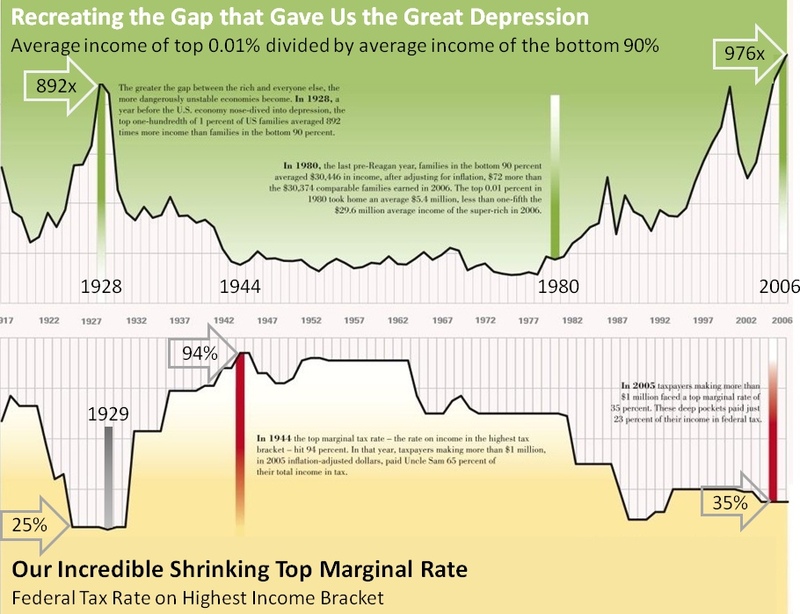 For example, a big problem with growing income inequality and stagnant income growth is the increase in the poverty rate and all that comes with it. The increases in revolts (as seen in Europe) may also lead to a revolution if it gets bad enough. Those at the top can easily survive a recession, those on the bottom have much fewer options.